Terminix, the regional franchise of Terminix International, has been locally owned for 70 years. With modest beginnings in a small office on Poydras Street, Terminix has grown to offices on the Southshore, Northshore, and in the River Parishes. 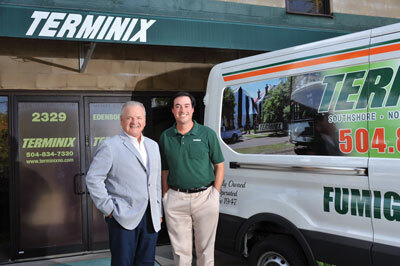 Terminix of New Orleans has been internationally recognized for the company’s Formosan termite research and treatment techniques. The late founder, Eddie Martin, Jr., entomologist, was recognized as one of the country’s foremost Formosan termite experts. Recently, Martin was elected into the Pest Control Hall of Fame, which recognizes leaders and pioneers in the pest management industry nationwide. Today, Joe Martin, Martin’s grandson, and Vincent Palumbo, Martin’s long-time partner, oversee the largest privately owned pest control company serving Southeast Louisiana with 101 trucks and 140 employees. With a Master of Science degree in Entomology from LSU, Joe Martin serves as Vice President and runs day-to-day operations. Like his grandfather, he has a passion for preserving South Louisiana homes and buildings through high quality, researched-based termite and pest control.